Peridot rings are increasing in popularity due to brides-to-be seeking something different for their finger. Here at Diamond Boutique, we offer a unique selection of rings suited to both grand gestures of love, and a luxurious treat for oneself. Formed deep underground, peridot is a rare gem that exhibits yellow-green, olive brown hues. Revered in the Middle Ages for granting those who wore it the power of foresight, today peridot jewellery is a highly coveted item. 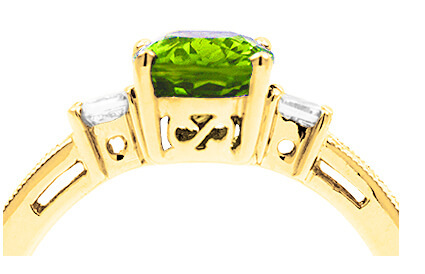 If you’re looking for the perfect peridot ring, you’re sure to find it in our collection. Alternatively, we offer a custom design service for a personal and bespoke service. Contact us today on +44 (0) 203 6959 885 for more details.